Sample a state uniformly in ambient space and project to the manifold. Return sample in state. Sample a state uniformly from the ball with center near and radius distance in ambient space and project to the manifold. Return sample in state. Sample a state uniformly from a normal distribution with given mean and stdDev in ambient space and project to the manifold. Return sample in state. Constructor. Requires the wrapper state space space and the underlying sampler sampler. StateSampler for use for a projection-based state space. Definition at line 60 of file ProjectedStateSpace.h. 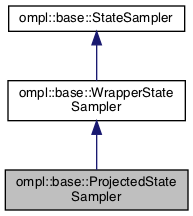 Definition at line 46 of file ProjectedStateSpace.cpp.